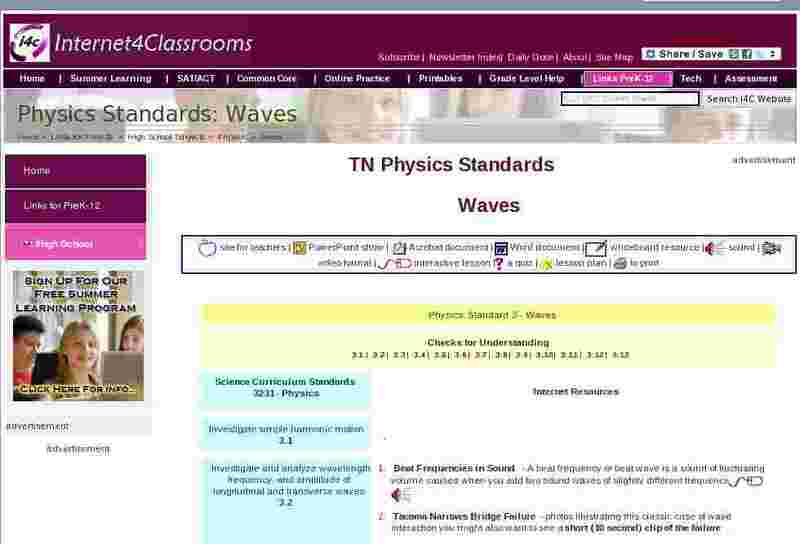 Investigate and analyze wavelength, frequency, and amplitude of longitudinal and transverse waves. Tacoma Narrows Bridge Failure - photos illustrating this classic case of wave interaction you might also want to see a short (10 second) clip of the failure. Standing Longitudinal Waves - This Java applet demonstrates the harmonics of the air in a tube as an example of standing longitudinal waves. Create standing waves (with reflection at a boundary) with this excellent java applet. Change parameters or step the animation forward slowly while viewing the component waves to investigate interference. To isolate wave reflection, you might want to view the reflection of a single pulse. Hearing Subtraction - (an activity on frequency and beats) This site allows students to hear beat frequency caused by two sounds. Interference of two Circular or Spherical Waves - This Java applet shows the interference of two circular respectively spherical waves (e.g. of water or sound waves). Refraction of Light - The applet shows the reflected and the refracted ray and calculates the corresponding angles. Students can change the incident angle and the media. Describe a wave interaction as reflection, refraction, diffraction, or interference. Hooke's Law - This java applet allows students to change variables and investigate Hooke's law. Investigate reflection, refraction, diffraction, and interference of sound waves. Compare mechanical and electromagnetic waves. Java applet - Click anywhere within the gray area and drag the mouse. An arrow representing the source velocity vector will appear. Determine the speed of sound experimentally and describe the effects various materials and temperatures on sound transmission. Solve problems related to wave length, frequency and speed [wave velocity: v =f ?]. Determine the speed of sound experimentally using various materials and temperatures [sound velocity: vs= f ? ; Sound velocity (using air temperature): vs= 331.5m/s + (0.56 m/s oC) (T)]. Compare the wave characteristics of natural auditory phenomena. Decibel Levels - This Cool Math page contains a list of decibel levels of everything from guitars to jet engines!